Le Cinq has had three chefs over the past two years. Although it's kept the same name, has been in the same George V hotel, and has been housed in the same beautiful baroque dining room, it has been three different restaurants with each chef exercising his vision of what fine dining should be. The first chef, Philippe Légandre, brought the restaurant its three Michelin stars with a refined seafood-focused menu highlighting simple flavors and combinations. 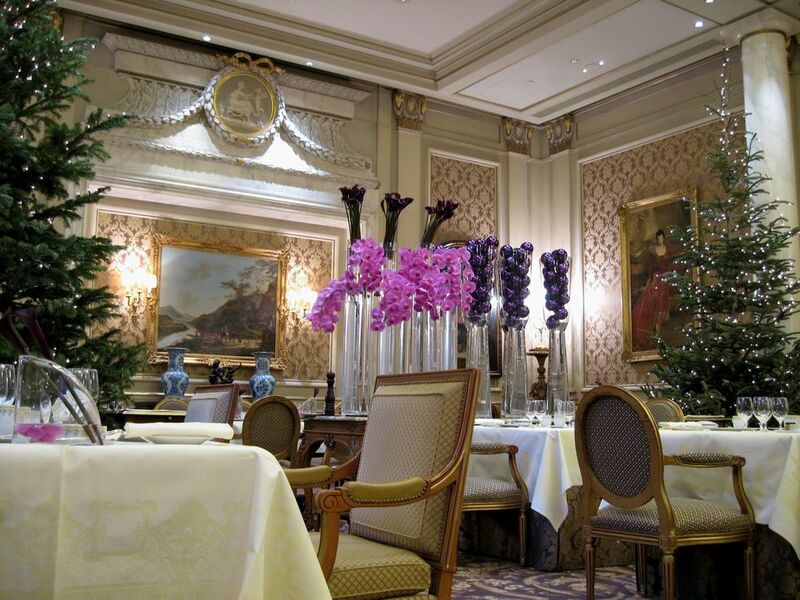 Then in February 2007, Le Cinq lost its third star. Légandre stepped down. His sous-chef took over during the transitory period and played off the better known dishes with minimal modification. Most recently, Éric Briffard took house, specializing in rustic yet sophisticated dishes bringing Le Cinq to an all new high. With him as chef, it's only a matter of time before the third star returns. 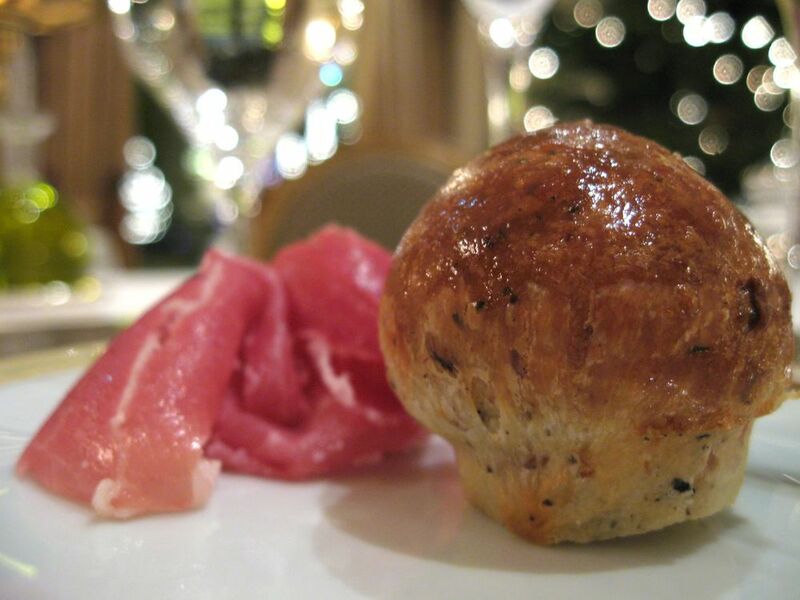 My first meal at Le Cinq was under Légendre and at night with my family. The candle light from the outside courtyard poured in through the French windows. When combined with the dinner candles, the restaurant became quite warm and intimate, the subtle gold leafed molding shimmered the candles' reflections. The intricate molding, paneled walls, and oil paintings make eating here feel like dining in a well-lit library. It quickly became my favorite evening dining room in Paris. 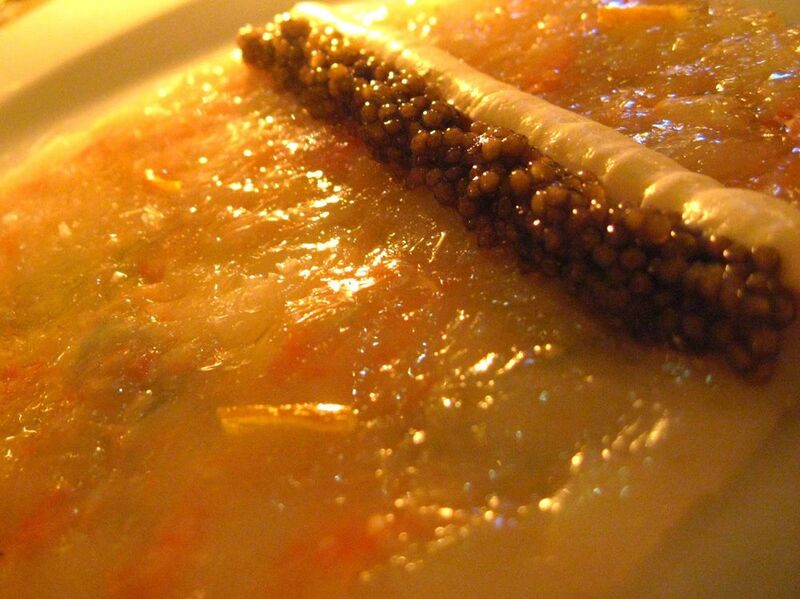 My first dish under Légendre was raw langoustine carpaccio with ossetra caviar and crème fraîche. If a perfect combination of ingredients existed, it could be this. Sweet langoustine, salty and briny caviar, lightly acidulated crème fraîche made me want a second serving. This was very light and creamy at the same time; a perfect accompaniment with a glass of champagne. Next came a fricassé of lobster and fresh vegetables, a small pile of large unshelled chunks of tail and claw sitting in a lobster broth. The firm blue lobster was lightly cooked so it remained moist. The thin broth had a flavor strong enough to stand on its own as a soup. Strong, yet precise. Dessert was an outstanding caramelized vanilla custard medallion served atop a bed of fraises des bois, in a tart strawberry reduction. The texture of the custard was really interesting -- firm enough to maintain its shape yet soft enough to slowly seep between the cracks of the wild strawberries. The top of the custard had a thin sheet of caramel that flaked at the first few pokes with my spoon. The medallion tasted like sweet vanilla and rich butter with a hint of burnt caramel, freshened by the tart and sweet strawberries and sauce. It was really wonderful. My sister ordered a chocolate soufflé served in a square rammekin. The strong taste of dark chocolate contrasted with its light and fluffy cloudlike texture revealed that she would be happy too. This was the highlight restaurant of our family trip. My second return during the transitory period was full of excitement. At the time I was switching apartments and stayed here for a few nights during the transition of my own. Frankly, Le Cinq was a major factor in choosing where to stay ... it would now be technically feasible to have three meals a day here with just a short walk downstairs. 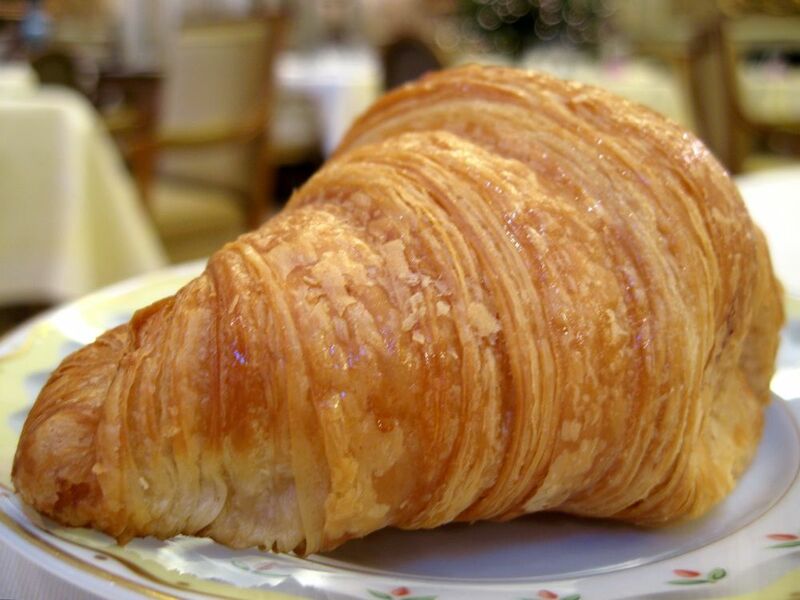 I started with breakfast, waking up really early in hopes of a warm croissant. Except breakfast was no good. This really has little to do with the dinner staff since the breakfast team is different; but the restaurant still has the same name and, like my experience at Alain Ducasse for breakfast, should still have an impressive first meal of the day. The breakfast "amuse bouche" was a pear custard which tasted like eggs with the grainy texture of pear. I didn't like it. The croissants despite having nice layering were glazed with sugar, which made them too sweet and sticky on the surface. Not really sure why the croissants were brushed with sugar. It just seemed unnecessary. 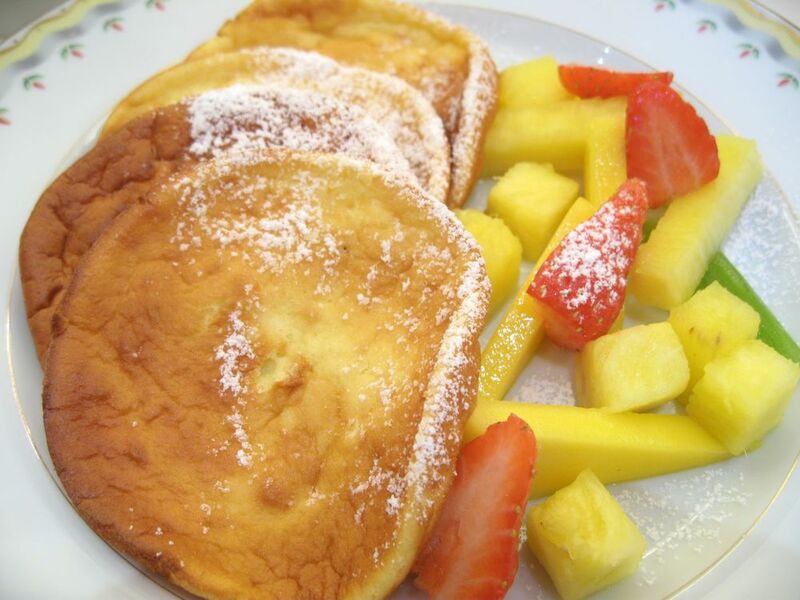 My pancakes were soggy, dry, and cold, served with unacceptably firm mango and strawberry, littered with powdered sugar. For the following days I stuck with assorted pastries and coffee -- the best way to navigate the menu. I returned later that night for dinner. It was my first time back since Légandre had left. The dining room for whatever reason was lit much more brightly than I’d remembered. And my photos verified my suspicions. The house lights were interfering with the candlelight. It felt much less intimate. The space suddenly felt huge. 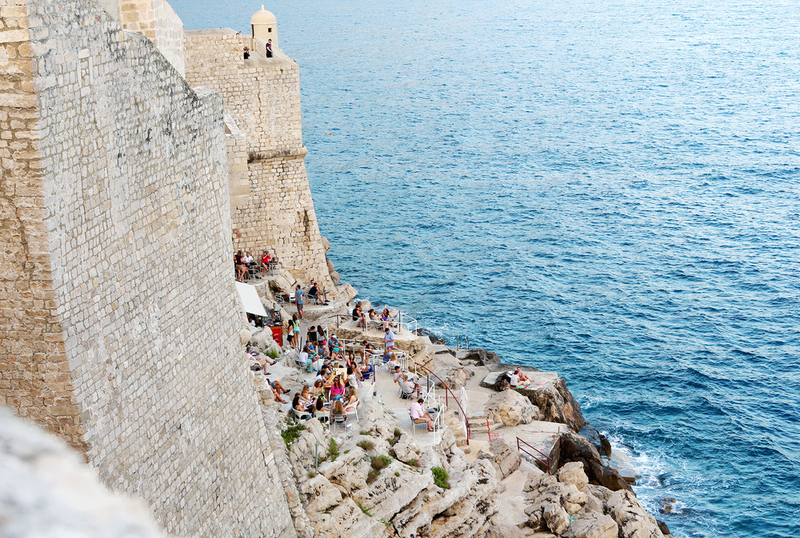 It no longer had the romantic and intimate feel that I enjoyed so much the last time. Like a flag hung at half height, perhaps this was the omen I should have listened to. Since they had not devised a tasting menu yet, the waiter helped me to put together a tasting that would trail through the best dishes of the winter menu. Service started with some really nice bread: sourdough rolls with a touch of whole wheat. The glutens held strong in a tug-of-war as I ripped off each piece. The bread was served with French olive oil in addition to butter. Sensing my excitement to be here, or perhaps my appetite, the waiter offered me some cured ham with an olive brioche to snack on while the kitchen worked. The brioche was a bit dry. I appreciated the delicacy of the olive flavor; it wasn’t distracting. The first course was crème de cresson au caviar de la mer Caspienne, a watercress crème topped with a dollop of crème frâiche and Sevruga caviar. This small pot of soup was top heavy, to say the least. Completely overwhelmed by the cold acidulated crème, the flavor of the watercress was nearly impossible to taste. The crème was thick, too; more like cream cheese. I took a few spoonfuls of the broth beneath, and scooped the remaining caviar onto thin slices of the house bread, and left the rest of this dish untouched. 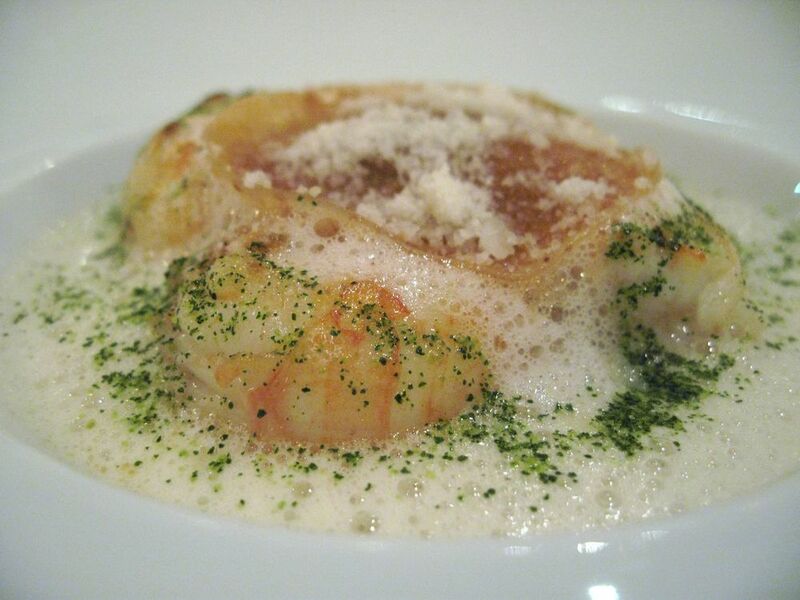 Next came the fricassée de langoustines Brettones, lasagne au viex parmesan: large Brittany langoustines layered with sheets of pasta and aged parmesan. The smells of Parmesan and butter quickly filled the table. The langoustines were cooked on the border of raw and slightly translucent, keeping them soft and absorbent. The presentation seemed a bit sloppy, as did the intemperate portioning of strong cheese, which completely muted the langoustine. I also found this dish quite oily, perhaps from the warm Parmesan or simply the abundant butter. I thought the tarte d'artichaut et du truffe noire du Périgord -- strips of artichoke and black truffle sandwiched between between layers of soft bread -- was to be the highlight of the evening; except it wasn't. TThis sandwich sat atop a bed of raw spinach. Not sure what purpose the dry, raw spinach served. Even the bread itself was dry and since this dish as a whole was minimally sauced, my mouth thirsted for moisture. The plate was encircled by truffle oil with ground black truffles, a dressing for the spinach. Everything about this dish was just off. 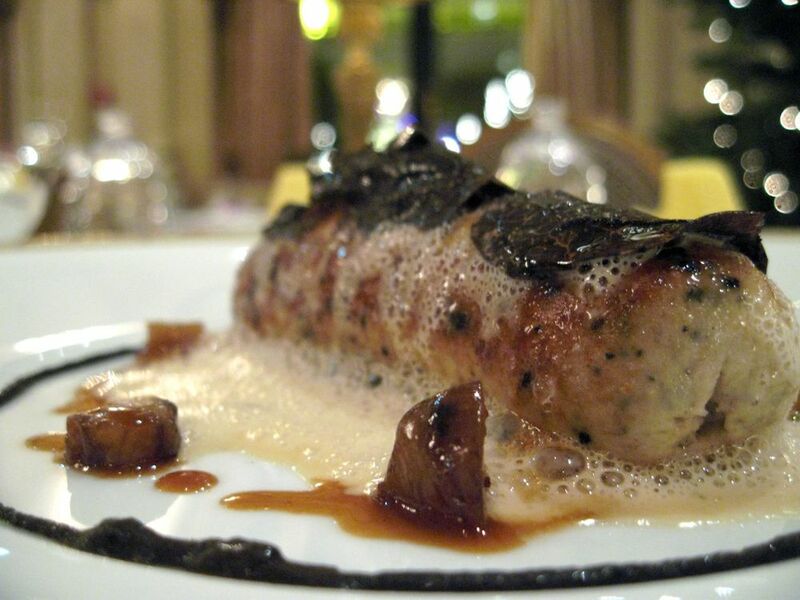 Last of the main courses was a boudin blanc façon George V à la crème de truffe, a white pudding topped with a black truffle crème. This was the highlight of the evening. The elastic skin gave way to a crumble of pork and bread, perfect for absorbing the truffle sauce below. This was quite filling. Dessert was titled Le Surprise; because it was not clear exactly what filled the light meringue shell. Several cracks later, the thin shell gave way to an egg filled with vanilla sorbet and mango. The entire sphere sat atop a raspberry foam. This dessert was light and airy; but its flavors were nothing to write home about. Chefs take note, this could be a new way to facilitate staff training: "just tell them it's a surprise !" At the conclusion of the meal, I was left in a daze. The Le Cinq I'd remembered under Légandre was no more. This was a really bad experience. However I didn't give up. I just didn't return until a new chef returned to the kitchen. And when Briffard joined in early 2009, things changed. The restaurant became better than ever. My first visit under Briffard took place just weeks after he took house. Briffard has a natural ability to make complicated dishes with many ingredients seem simple and approachable. He also has the humility to let high quality ingredients stand on their own with minimal preparation. 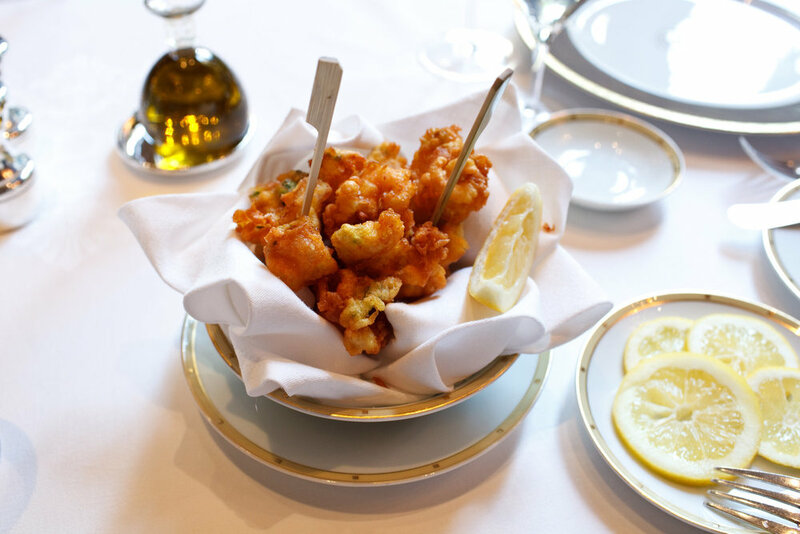 Take for instance his accras de crevettes et calamar, a basket of lightly battered shrimp and squid served with fresh lemon (which happens to pair perfectly with a glass of champagne). These were so lightly fried using batter so thin that no oil stains were visible on the napkin beneath. The dish came with lemon slices; but to be honest, they weren't necessary. The hot shellfish was well-salted, it really needed nothing else. 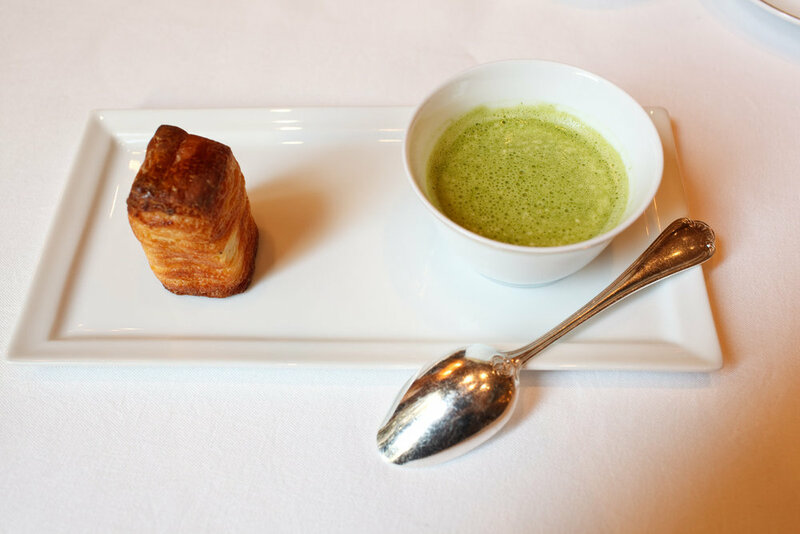 A second amuse came next: a watercress soup with a butter-laden brioche. The brioche was layered, which made it seem more like a feuillantine. The pastry itself was a bit dry; maybe it was made in the morning for lunch service. The flavor of the thin soup was enjoyable, both pure and simple. The pastry and soup being only a few inches apart made dipping inevitable. I would have liked a stronger flavorfrom the watercress; but then again, it's a subtle plant. The next course was tasty: a small crab salad topped with white raddish. A seemingly simple dish delicately balanced with just the right amount of mayonnaise, olive oil, and crushed olive to hold everything together. The chilled crab was bursting with freshness. Briffard has a special ability to make carefully executed dishes seem like he quickly threw them together. 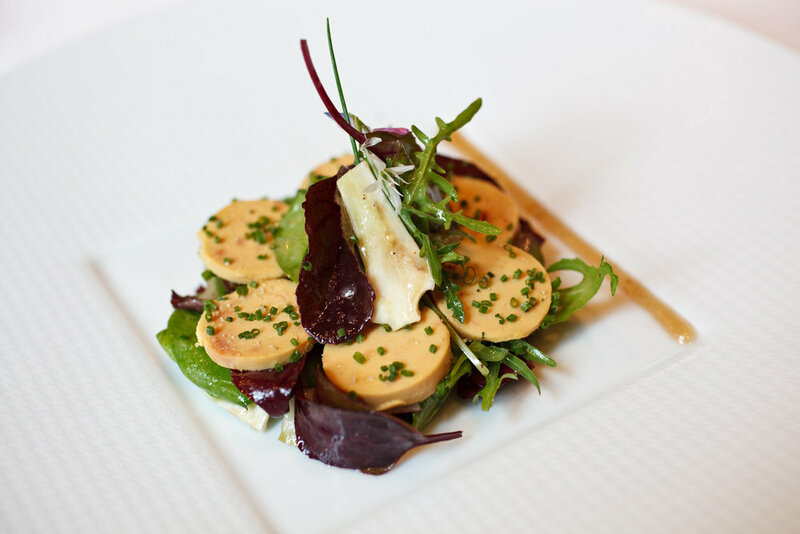 Our next course of medallions of foie gras sitting on a bed of mixed greens testified to that talent. My friend Julien, with whom I shared this meal, really enjoyed this dish for its stark contrast of rich and buttery foie with clean and crisp greens. For me, this was the low point of the meal. I thought the liver was too fatty and its flavor too dull. The cold medallions tasted like sticks of refrigerated butter. However things quickly picked up. 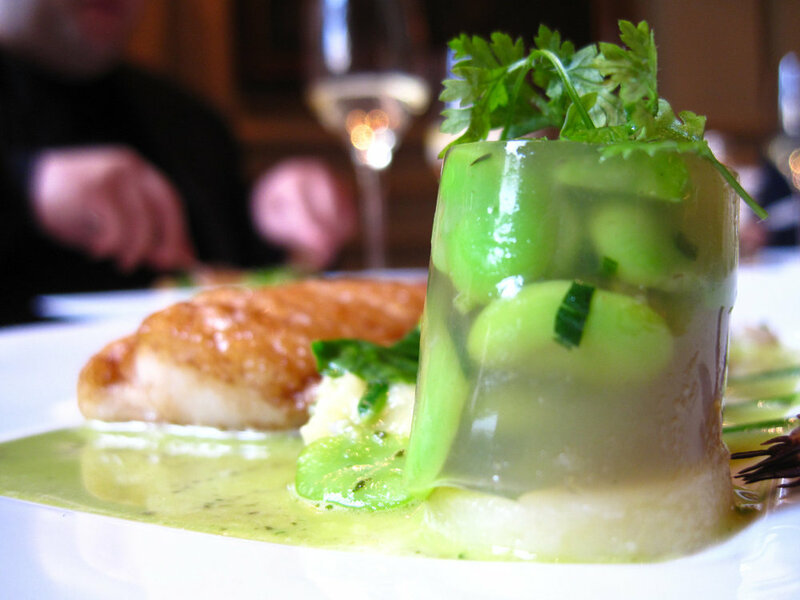 Our next course was Merlan de ligne, Saint Gilles Croix de Vie, a generous filet of whiting garnished with fava beans en gelée and rice. While the whiting was delicious, soft and slightly acidic, the real highlight of this dish was the fava beans. They were cooked but edged on raw giving them a starchy crunch that absorbed all the sauces on the plate. I sort of pushed the whiting to the side. The beans stole the show. 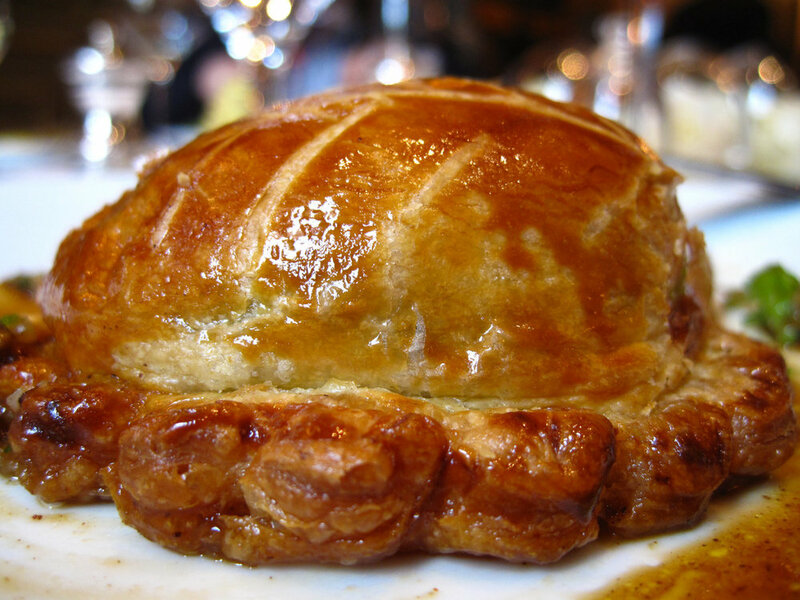 Next came the highlight of the meal, Tourte de Pigeonneau dui Pays de Racan, an individual pigeon and foie gras puff pastry. Unlike the feuilleté at L'Ambroisie, this little tart came pre-sliced. The interior of the savory pastry was lined with a cabbage leaf to lock in the moisture while preventing the shell from becoming soggy. The outside remained dry, crispy, and shiny. As I parted the pastry, juices poured out and released a small puff of steam. It was clear that this had just left the oven. The cut of meat was very lean, so the foie gras picked up on the creaminess that complimented the gamey texture of the pigeon. I couldn't get enough of this hearty dish. The dessert looked fancy and elegant: a cylinder of brown sugar chantilly wrapped with gold leaf. While pretty and geometric this dessert was bitter, sour, and sweet all at once. One bite was more than enough. This academic creation was a sign that the pastry chef still has a bit of catching up to do to with Briffard. The dessert trolly had the real dessert here filled with chocolates, cannelés, and fraises des bois. 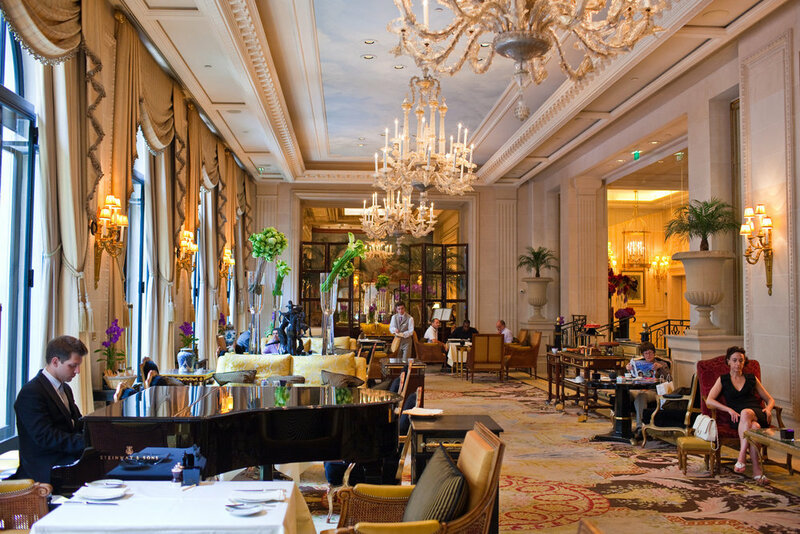 I returned to Le Cinq a few weeks later, only this time with my family. The fried shrimp and octopus was a hit with my mother and sister. This time, the amuse-bouche was a slate tray holding three small bites of vegetable-centric starters. From left to right sun-dried tomato with pasta and olive oil, a vegetable samosa, and a tomato gazpacho with avocado. None of these were particularly memorable. What was memorable, however, was how each bite was at a different temperature, heightening the overall sensation of the plate: the gazpacho was very cold, the samosa very hot, and the sun-dried tomato somewhere in the middle. The first appetizer of our lunch, however, was outstanding. Both beautiful and diverse, these first tomatoes of the season titled premières tomates de Provence déclinasion de variétés anciennes came split in two. The first plate contained layers of tomato alternating with fresh langoustine and avocado. 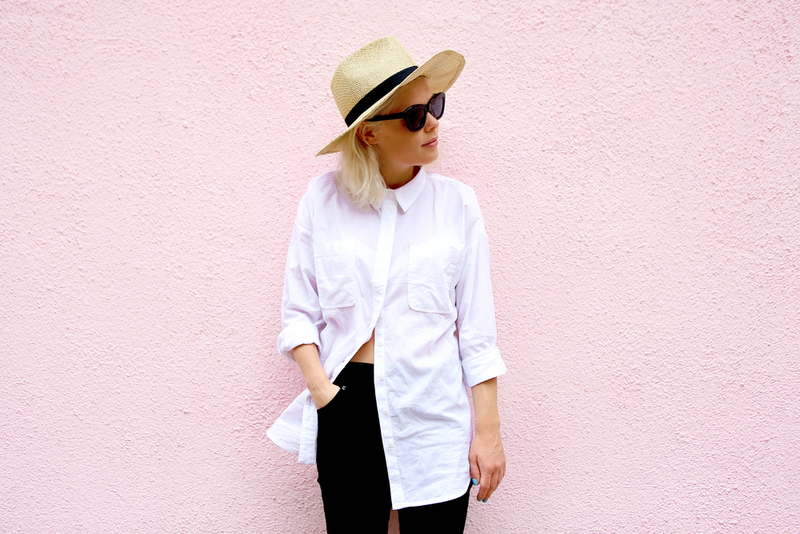 It was bright and fresh. I loved how the tomato interacted with the langoustine and avocado creating a creamy yet slightly acidic texture and flavor. On the other plate a battered and fried whole tomato was made even sweeter by the gentle cooking. To its side sat what I would call gazpacho ice cream: a tomato sorbet atop a thin layer of frozen avocado. The layered tomato plate was the highlight of the two plates for its textural variety. It kept me interested until the last bite. While it wasn't my first time having foie gras, it was my first time tasting liver this fatty. While this dish may seem and sound innocuous, one slice with my knife unleashed a pool of oil. The entire square portion of my plate was flooded with fat. This was the richest foie gras I have ever tasted. So rich, in fact, that I couldn't eat it ! I think this is a dish most people would have enjoyed; but for me, it was just too much. The flavor was a balance of sweet and salty, of charred grill lines and smooth muscle; but after a few bites I had enough. I much preferred the merlan de ligne meuière au laurier asperges blanches et girolles à l'abricot confit, a very lean cut of whiting served with chanterelle mushrooms and apricot confit. While a generous portion of fish, the diversity of the greens and mushrooms combined with the tart but sweet apricot prevented palate fatigue. The fish was very evenly cooked without any kind of crispy surface; it was soft and moist throughout. The real highlight of this meal, however, was the pintade fermière des dombes dorée à la feuille de citronnier avec melon confit, fenouil y olives noires. This clever plating separated the guinea fowl into white and dark meat, a yin-yang of lean and fatty. The fowl was served with lemon tree leaves, melon confit, fennel, and black olives. While the menu read all these ingredients, I struggled to find them all on my plate. Once again, Briffard makes this dish is deceivingly simple. The meat was a bit dry; but, the gratuitous saucing covered that quite well making the cuisson difficult to complain about. The desserts this time around had improved greatly from my first visit. Starting with the betterave et fraises gariguette en compression de meringue, yaourt glacé, citron confit et poivre sauvage, I had a spring bundle of beet root and gariguette strawberries topped with dense meringue, yogurt sorbet, lemon confit, and wild pepper. Really a vibrant and eclectic list of ingredients. The gariguette strawberries were reminiscent of fraises des bois, having a smaller size with more seeds and a sweeter flavor. The wild pepper picked up on this spicing the back of my tongue while the yogurt sorbet soothed the front. The more classic dessert of the two was the soufflé maracuja, gianduja coulant et croustillant, sorbet passion-Malibu, a passion fruit soufflé filled with warm gianduja. This nutella-like filling softened the subtle but tart notes of the soufflé making the combination very balanced yet still playful. I didn't care much for the sorbet on the side; but frankly, my attention was elsewhere. Interesting that the plating of the soufflé stayed the same under both Briffard and Légendre. In fact, they were nearly identical. Both were exquisite. The final course was a cold and refreshing glass of Wattwiller zero nitrate water designed to clense the body and serve as a simple yet effective digestif. Since it was a beautiful warm day outside, I asked if we could take a few of the desserts from the trolly and sit outside in the courtyard for coffee. The Maître'd happily obliged, and he sent the petits fours our way under the sun. He also sent along a little tray of fraises des bois, which frankly, couldn't have been a more perfect way to finish this meal. 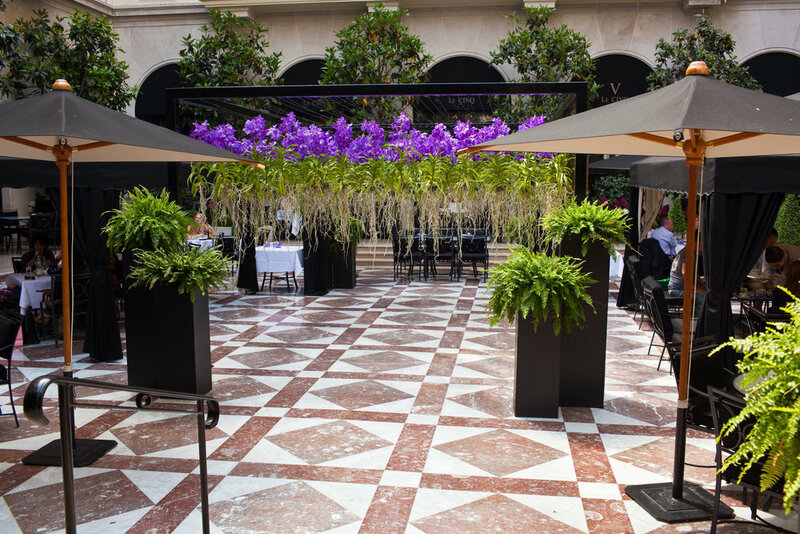 Le Cinq has been through quite a transition over the past two years; but it appears that the food quality, like a fine wine, is only getting better with age. Briffard was definitely the right choice for this restaurant. I am quite confident that as his hearty yet precise cooking style further develops, it will be no time before Le Cinq regains its third star. In the meantime, now is a great opportunity to take advantage of what this newly refreshed restaurant has to offer.